Recently, I was going to a potluck lunch with a group of girls, so I decided to make something special and fancy. 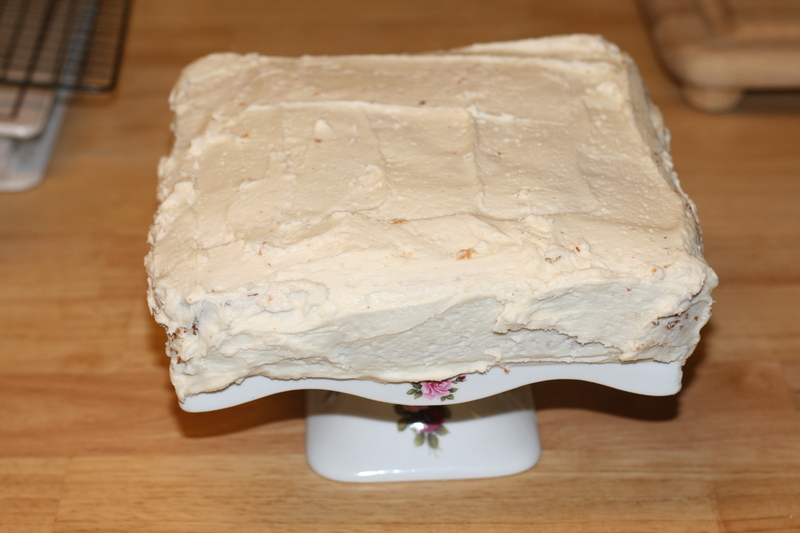 I made a golden chiffon cake from Gram’s recipe. 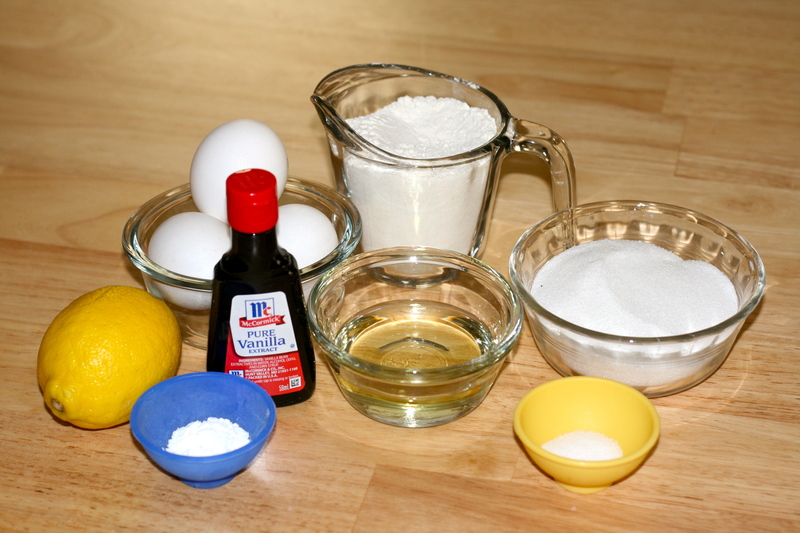 The ingredients are very easy and I just followed the instructions carefully. So first combining the dry ingredients in a sifter, then adding in the wet ingredients and mixing well. So far so good. Next I whipped the egg whites. And I whipped them. And I whipped them. It took quite a long time because it was warm, and egg whites whip better when it is cold and the bowl & beaters are cold. Strangely, they also whip better when they are at room temperature. So I whipped them forever. Did I ever tell you that is Gram's mixing bowl? I actually wonder if I could have whipped them longer. Now the next part is to fold the batter into the egg whites. 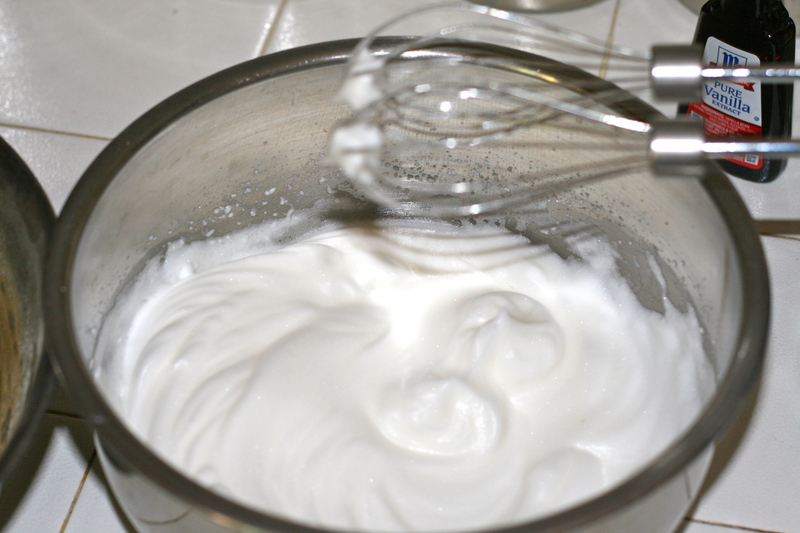 You have to be careful not to bruise the whipped whites or to deflate them, so gently mix from the outside to the inside of the bowl. Once combined, pour the mixture into an 8x8x2 pan. Now here I did make a mistake. There’s no butter in this cake mix and not a lot of oil, so I worried it would stick to the pan, and I sprayed the pan with non-stick spray. Don’t do that, no matter how tempted you are. So, when the cake comes out of the oven, it will be slightly rounded on top, and the instructions say “hang upside down until cool.” This perplexed me quite a lot because I figured the cake would fall out and/or break. I went with the instructions though, and turned the pan upside down onto a cooling rack. The cake stuck to the pan. 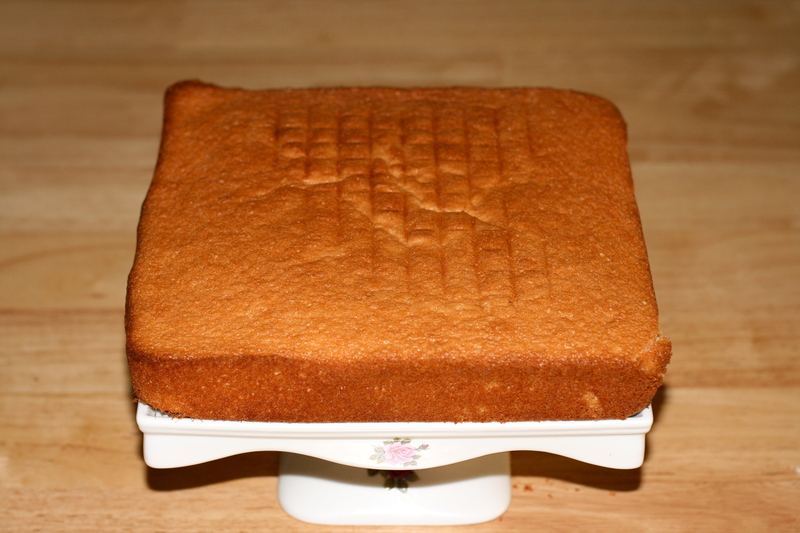 Slowly as it cooled, the edges came away from the pan and it settled onto the cooling rack. Hence the crosshatching. However, in one place where the non-stick spray actually remained, the corner of the cake was oddly shaped and hardened. I believe it needs the hanging process to make the shape and texture light and enjoyable. So here you have it, iced with vanilla buttercream. It was a light and somewhat spongey cake, but not like an angel food or even like a sponge cake. It was just very airy. It would be good with the lemon, which I decided not to use after all, but it’s not required. You could even try orange for something different. Writing from Palm Desert – I’m glad you mentioned the bowl from Gram’s stuff. In the picture you can’t tell that it is stainless steel (heavy gauge at that!) I don’t remember that recipe, but then I have missed a few in all my wanderings this summer. I will be happy to try your next attempt – think the lemon would be wonderful, but you know me and lemon. And icing of the same. I love that bowl. I use it nearly every time I make something these days. It is just the perfect size and shape, and so durable! It does leave a mark on my countertop, but it comes off easily. I’m trying to remember to put down a dishtowel first.